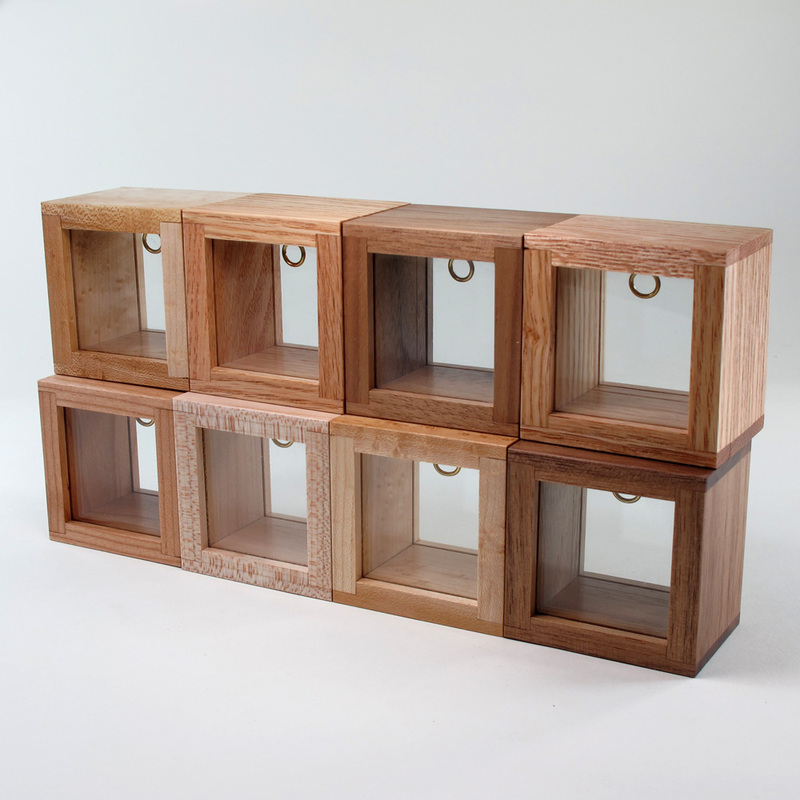 Handcrafted woodwork designed for use in storage and display. Boxes, cabinets, display cases and shadowboxes to provide safe environments for collectibles and to help keep special items close at hand. Perfect for small places needing to combine style & storage. Everything listed on my site is completely handmade by me in my shop from scratch. I use mostly recycled & reclaimed wood for my creations and focus on domestic woods and avoid any endangered exotic woods. Please contact me via email (jmcraftworks@gmail.com) for a custom order and I’d be happy to help with an original design for a special one-of-a-kind handcrafted item, a custom ring box, coin display case & mount, or a keepsake box. 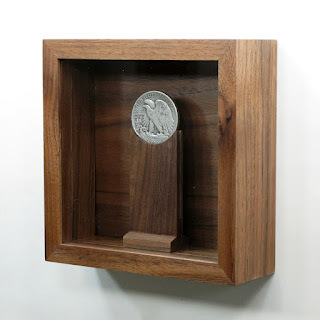 My design for a coin display. 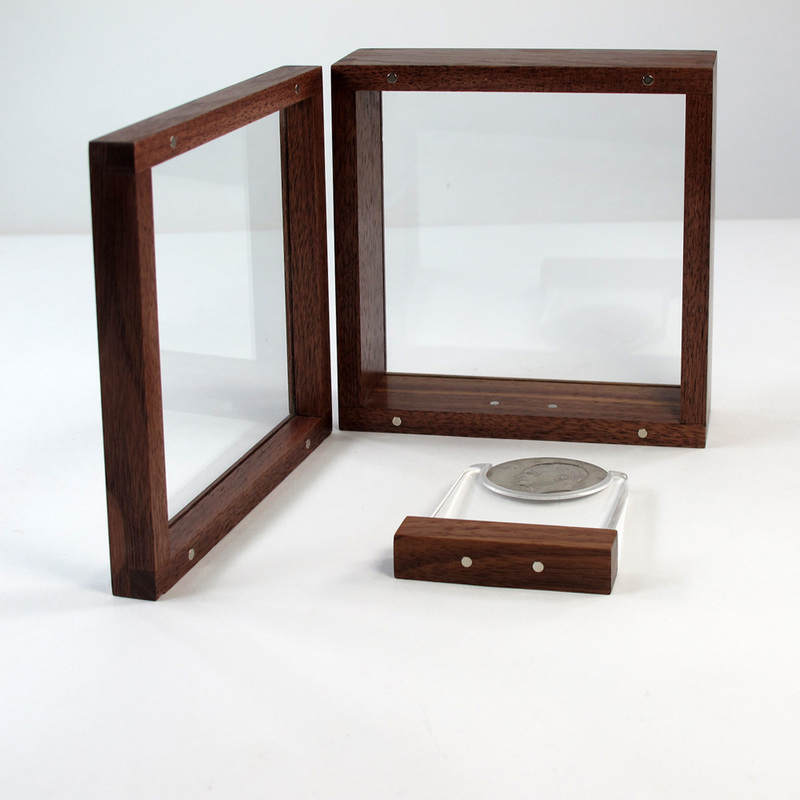 The display case is handmade of solid black walnut with framing glass front & back. The interior dimensions are 4" x 4" x 1 3/8". The front frame attaches with 4 pairs of n50 neodymium magnets for a secure fit that's easy to detach. 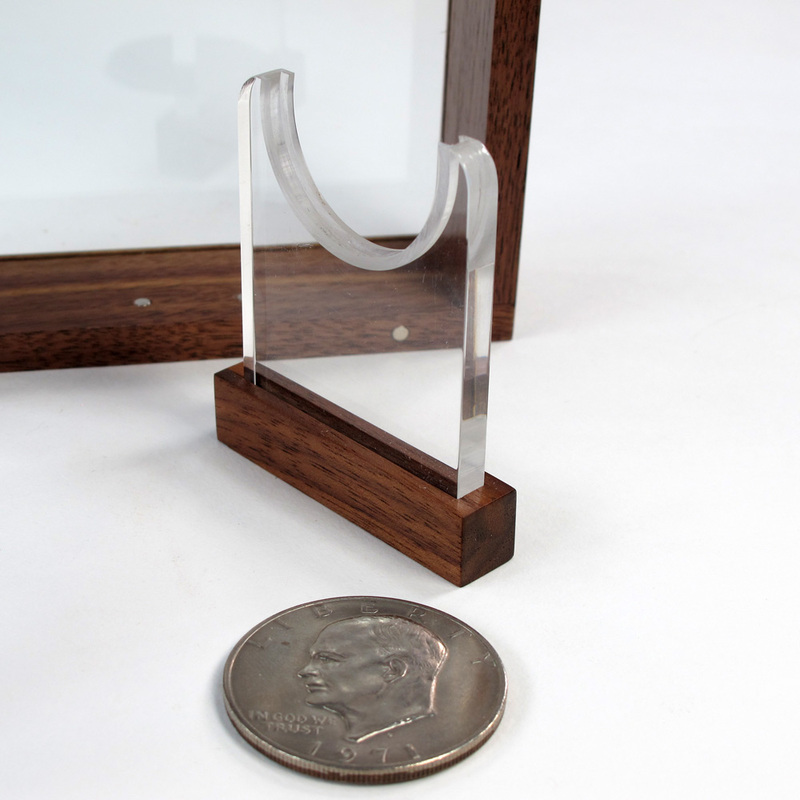 The coin mount is custom sized to your coin and uses clear acrylic for the support and matching black walnut for the base. 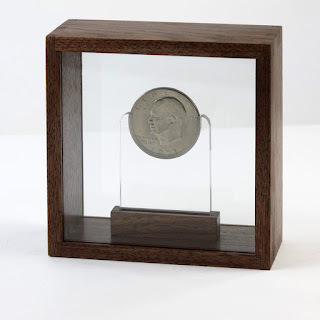 Most US dollars and Spanish 8Reale coins are 38mm in diameter (1 1/2")and most of the mounts I make are sized to hold these, although a mount can be made for half-dollars, quarters, even nickels. 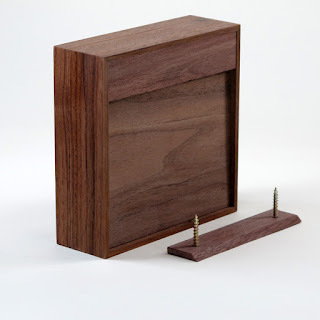 The base uses 2 pairs of n50 neodymium magnets to center the mount in the case and hold it stable while moving. The silver dollar in the example shown is 38.05mm in diameter and 2.5mm in thickness, although with photos and accurate measurements, I can custom cut a mount to fit most coins. 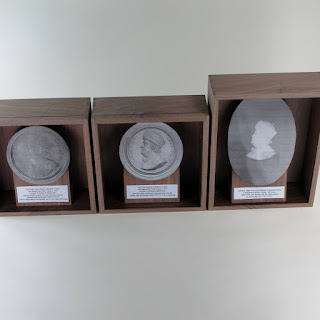 If you're interested, please email me at: jmcraftworks@gmail.com and I'd be glad to help you with a custom mount sized to fit your coin. These are variations on my basic ring box design. 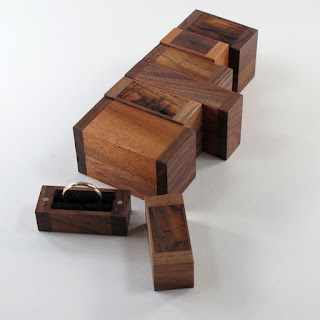 Using contrasting woods and inset pairs of magnets to secure the two halves together. The smaller ones hold a single ring, while the larger ones can hold 2, 3, or 4 rings. The insert is a strip of black foam that grips the rings securely but allows enough flexiblity to hold different widths of ring bands. I've been tardy in posting here, but orders have come in fast & furious and I haven't had time to do much else. 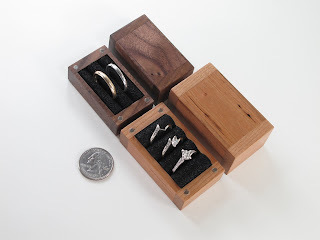 This listing is for the latest batch of little ring boxes and they're on the way to a jewelry shop in Vermont. Using a variety of hardwoods, and pieced together to deliberately create a little contrast. Still mostly using reclaimed woods, gathered from several recycling shops here in town as well as from the city taking out dead trees in our neighborhood. 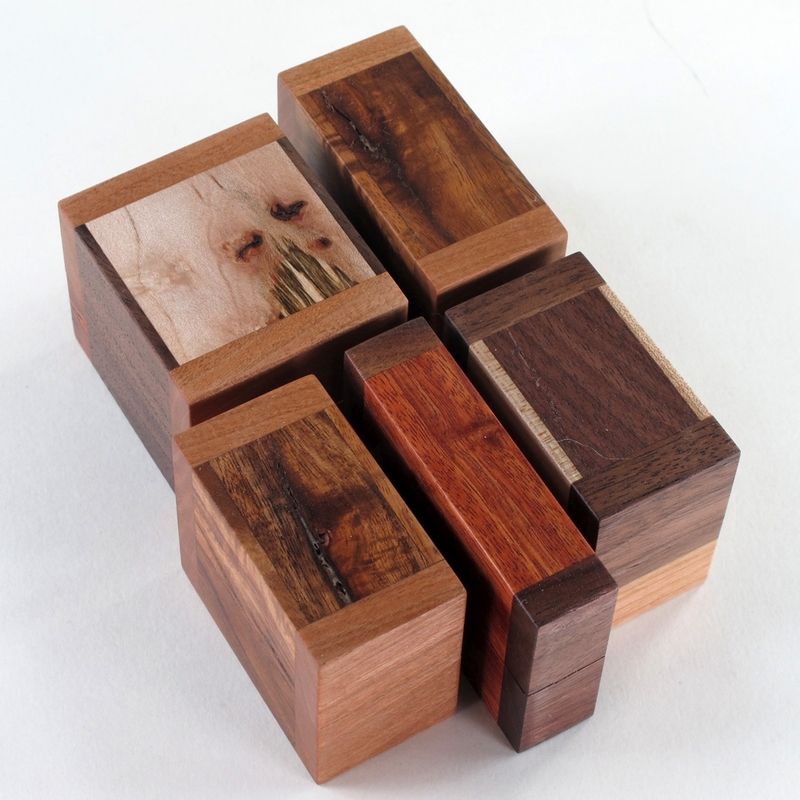 Since my pieces are so small, a section of tree trunk lasts a long time. 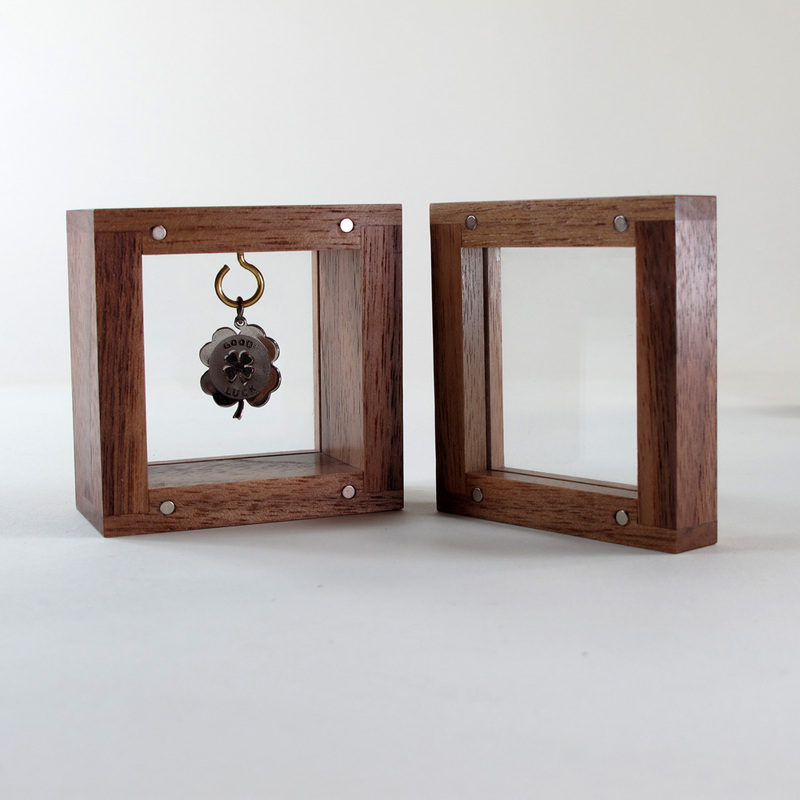 One of the more interesting projects I've taken on recently was for a series of 8 tiny shadowboxes, each to display a special charm. 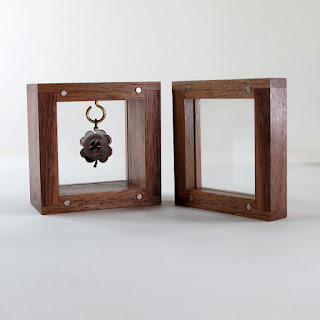 I used a variety of fine hardwoods, birds-eye maple, oak, cherry, walnut, and each had a small brass eyelet to hang a charm inside. The boxes had glass for glazing both on the front & back and the front frame was held in place with inset magnets, hidden when closed. This group of small boxes were made using scraps of recycled woods from the Habitat for Humanity Restore shop. I'm using a design that allows me to inset a panel in the top. I like using contrasting woods side-by-side and for six of the seven I used very rustic acacia wood for the top. You can find these and lots more at my Etsy shop. In my listings, I usually include coins in the photos for scale to help a potential client visualize how small these are. Also there's a link to a ring sizing chart on Wikipedia. End of 2016, start of 2017, I've been putting batches of little ring boxes on my Etsy site. These are all different sizes, shapes, and combinations of hardwoods, mostly stuff I've recycled from different sources. We have a Habitat for Humanity Resale Shop here in town, as well as a Second Chance Building Materials Center, Reuse Market and a Reuseum. From time to time, I've managed to find nice hardwoods at all these places and for the tiny things I make, it goes a long way. 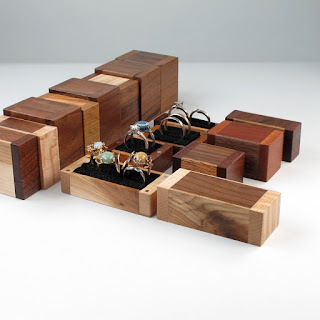 These little boxes are held together with tiny hidden magnets, making them easy to pop open and snap shut. And each comes with a folded insert that will securely grip rings so if you want to keep them hidden for a surprise presentation, they won't rattle. At the end of the year 2016 I had a commission for 3 custom shadowboxes. 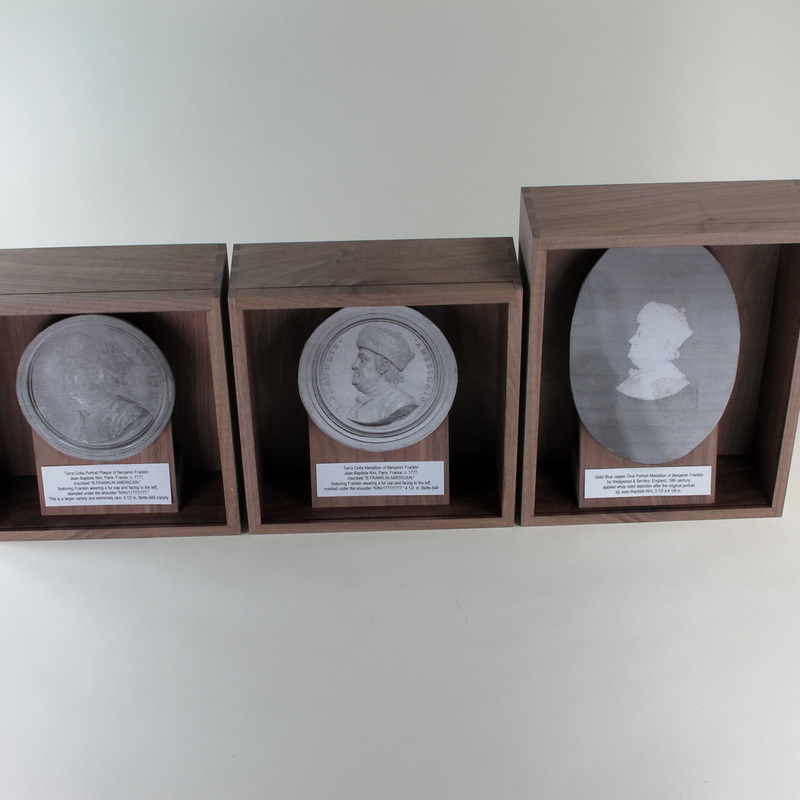 These were for 3 terra cotta Jean Batiste Nini Medallions of Benjamin Franklin. These were completed for the collector and delivered. Here are two photos. The one of the case with the UV acrylic door in place still has the paper coating on the acrylic. This stays in place during shipping for protection. 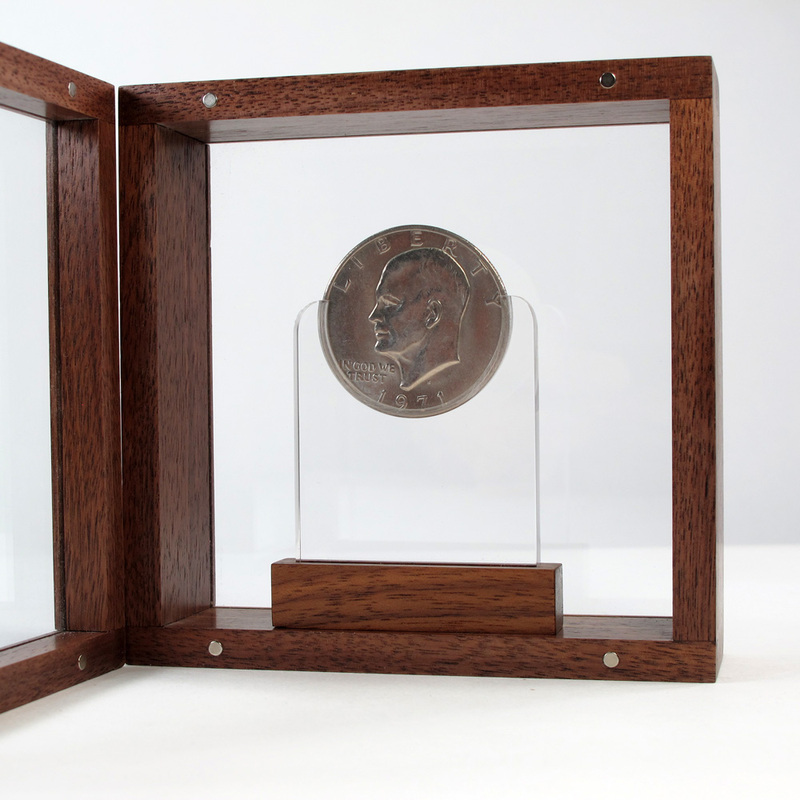 After it's removed, the acrylic glazing helps protect the collectible inside. 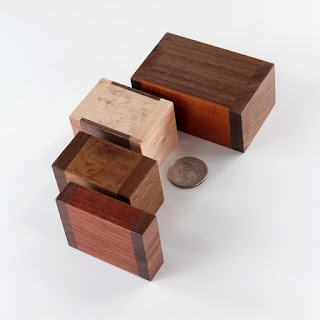 The second photo is of all three cases, two are square, one is taller for an oval piece. Inside are angled mounts for the medallions and I used cardboard mock-ups to help with spacing and placement of the labels. This was a slight variation of my standard shadowbox and used all solid black walnut hardwood, designed for free-standing placement on a shelf. 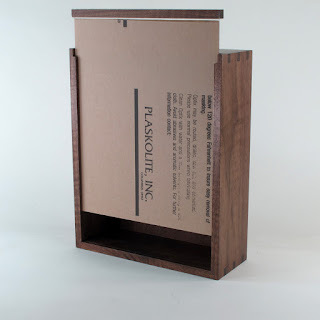 Instead of glazing on front and back, this client wanted a solid walnut background and the case was designed to hang on the wall. A recessed french cleat was added in the back and with the cleat, it could be easily hung on a wall for display. This was for a single coin from Artifacts and the size was 4" square x 2" deep. 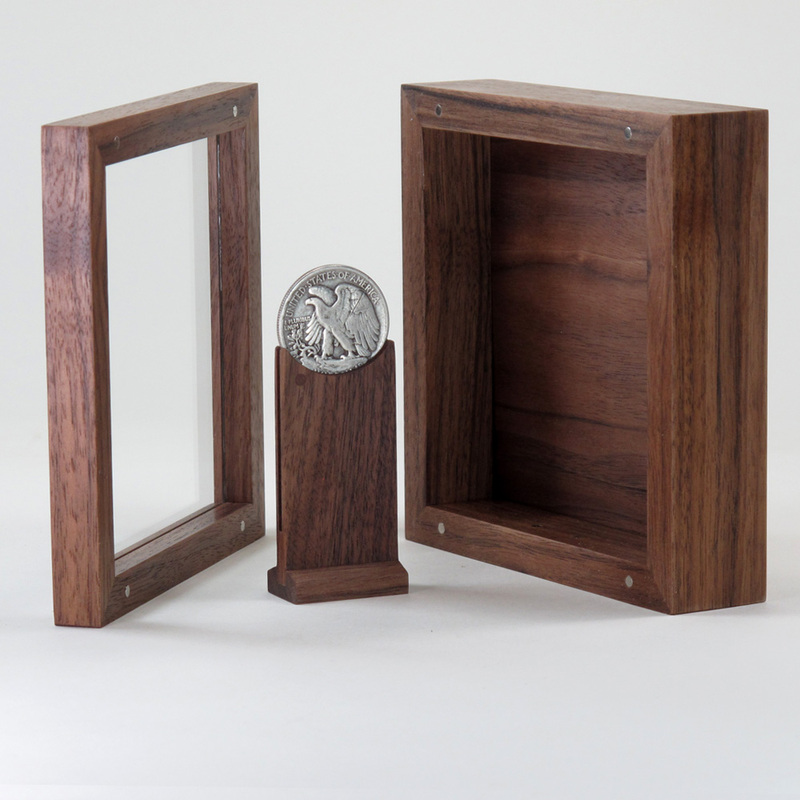 The front frame attaches with hidden magnets and opens the case so the coin can be positioned in the mount. And the removable frame houses the glazing, a thin sheet of framing glass. The coin in the photos is mine and used because it was close to the size of the client's coin, a silver 4 Reales and I used it as a stand-in to design the coin mount. A batch of larger keepsake boxes to be added to the Etsy shop. 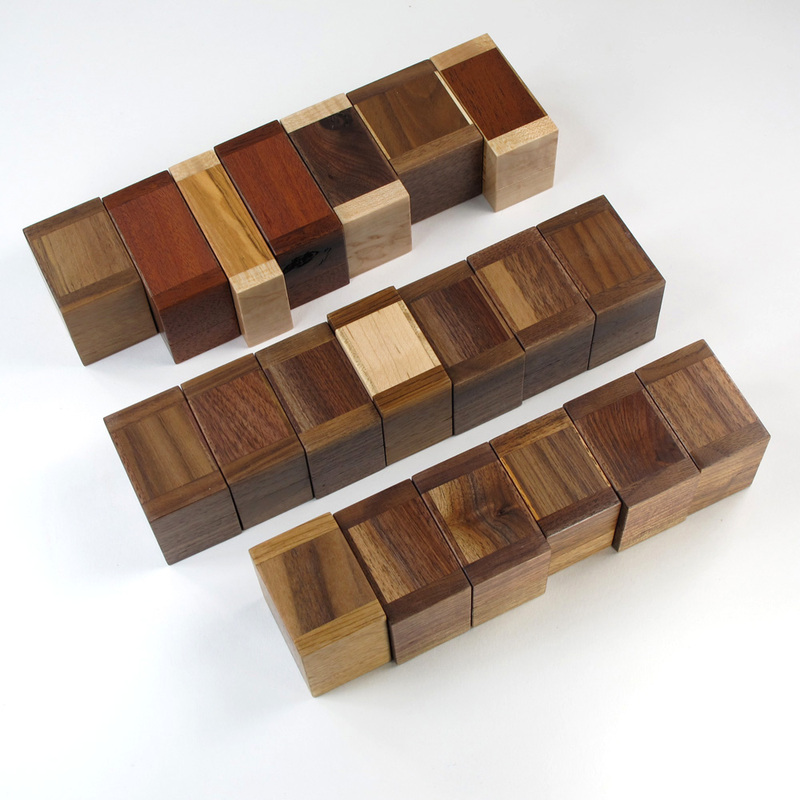 Combinations of various hardwoods, most of which were sourced from recycling centers here in town. Whenever I come across an especially interesting scrap with knots or dramatic grain patterns, I like to slice it into sections that can show off the unusual character. Mostly, I work with domestic woods and generally avoid exotic endangered woods. 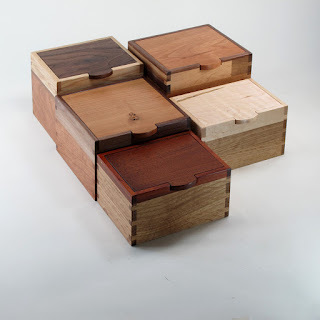 These containers are good for jewelry boxes, valets, or keepsakes and vary in size and shape.